Associate Packers and Movers is a young, dynamic and fast growing company. We are looking for dedicated, dynamic, passionate young players and leaders with a team spirit, professional attitude, excellent communication skill, quick learning ability and customer orientation. How is Associate Packers and Movers different from others? With its quick and professional service, Associate Packers and Movers has proven itself as the leading packers and movers in the country. How can we have faith in services of Associate Packers and Movers? Associate Packers and Movers ensure best quality services and its Registered TRADE MARK mirrors its best quality. Can I get my goods shifted quickly? Associate Packers and Movers know the value for your time and hence move your goods efficiently and without wasting your time. Do I need insurance even if the packing is done skillfully? Though Associate Packers and Movers use high quality packing material depending on the nature and fragility of the goods, items can get destroyed because of some unpredicted calamities like heavy rains, accidents etc. How much time has to be spent for packing and loading process at my home? Usually one bed room house will take minimum three to four house however this time varies from house to house and it depends on the no. of goods you have. Can I also move my vehicles safely? Yes. 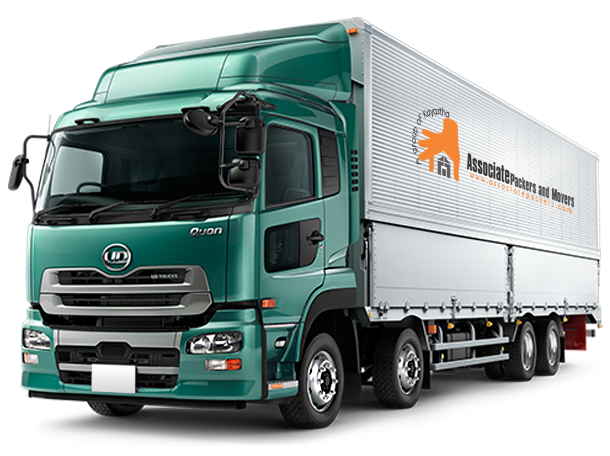 Associate Packers and Movers also undertake vehicles shifting like cars and bikes. We will use special containers in order to move your vehicles in safe and sound conditions. How we can trail our shipment? We will be constantly in touch with you during the entire process. You can also take help of our 24 Hrs. customer care center to track your consignment. Why only Associate Packers and movers? We provide quick services and we do not compromise on quality of our services. Our professional manpower is happy to help you any time. We also ensure safety of all your goods during the entire relocation process. Can I get services of Associate Packers and Movers in my area? Associate Packers and Movers have its all-inclusive network spread in all major cities in the country. It caters to all the major areas of all the important cities. So wherever you are, our network follows! Can I get warehousing facilities? Yes. Associate Packers and Movers provide both Long term and short term warehousing facilities. We will provide you up to 15 days warehousing facility absolutely free of cost. Is the pricing structure affordable for me? Yes. Of course. The pricing structure of Associate Packers and Movers is very reasonable and easily affordable. The prices and quality of the services offered go hand in hand. The costs are nearly 25% less than other packers and movers and the quality is around 25 % better than other packer's and movers. I need delivery on a specific date? Yes, if there is any Tax by state government paid by Shipper's / Receiver's only If lorry detain due to any reason detention charge will be Rs. 2,500/= per day paid by Shipper's / Receiver's only. You look over the terms and conditions of your estimate prior to signing your estimate. Why should I book my move with Associate Packers and Movers Group? Associate Packers and Movers Group has been in business since December 2005. Associate Packers and Movers Group is a full service moving company not a broker or a sub contractor we will take you throughout your move and give you 100% of customer service for all your needs. Associate Packers and Movers TRADE MARK certified company . It's preferable to book your move 2 weeks in advance especially if you want to move on a Friday, Saturday or Sunday. Can I get a binding quote? Yes, Associate Packers and Movers provide binding estimates. I need pick up on a specific date? For moves originating out of Associate Packers and Movers we can guarantee the pick-up date. If there is part load booking How customer's items kept separate from other customers? On moving day items are tagged with inventory stickers that are color coded, lot coded and numbered. A detailed inventory is taken of those items and their condition is made at pick up and kept with the shipment to check off.